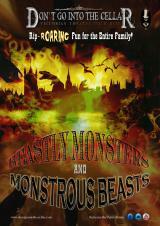 Rip-roaring fun and interactive theatre for all the family! Don't Go into the Cellar Theatre Company returns to Daventry Museum with a spectacular show with much audience participation. 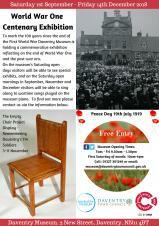 To commemorate the lives of the 114 soldiers from Daventry who lost their lives during the First World War, Daventry Museum has invited local Daventry schools and community groups to make and decorate a small model chair to represent each individual soldier. 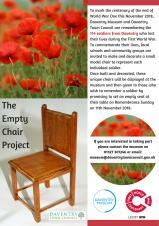 Once built and decorated, these unique chairs will be displayed at the museum and then given to those who wish to remember a soldier by promising to set an empty seat at their table on Remembrance Sunday on 11th November 2018. This will be the eighth year running that Daventry Town Council will be putting on a fireworks display. More information regarding the event will be released nearer the time.